Now Xiaomi Redmi 1S user can update their phone with the Android 5.1.1 Lollipop LMY48B. To Apply this new update you have to install MoKee ROM build, which comes with lots of features and lots of bug fixes. The best of the ROM is that its pre-rooted, that means you don’t have to root the phone, and you can easily get the OTA updates on the phone. If you are the Redmi 1S user and want to try this new update on your phone, but don’t know how to do that. Don’t worry, here is the complete tutorial that you can follow on your phone and install the Android 5.1.1 on your Android phone. The process is very simple and all you need a rooted Redmis 1s with custom recovery to flash the ROM zip on your phone. Before following the below mention instruction, do take the full backup of your phone and make sure the battery of your phone is above 50%. Step 1. As we mention above to apply this update you need a rooted phone with Custom Recovery. To root your Redmi 1S follow this guide. Step 2. Once the Phone is rooted, install the TWRP Manager from the Google play store and install the recovery on your phone with TWRP manager app. Step 3. 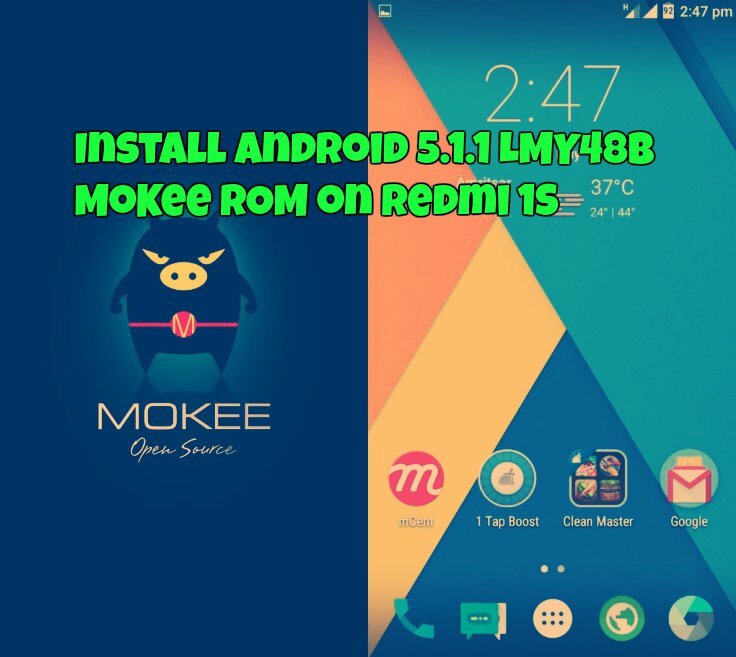 Now Download the latest Mokee Android 5.1.1 ROM from here. And save the file on your phone memory. Step 4. Now download the Gapps Package for the ROM here. You need to install these Gapps to install the Google applications on your phone. Step 6. Now from the TWRP recovery menu, select Wipe. Also do the advance wipe and select system, data, Dalvik cache and cache. Step 7. Select the “Install” option from the menu and choose the MoKee Android 5.1.1 ROM .zip file And flash it. Step 8. Now Install the Gapps package that you saved on your phone at Step 4. Step 10. Finally reboot the phone. That’s it. Now your Resmi 1S Android smartphone is running on the latest Android 5.1.1. Can this same ROM, with the same process be installed on Mi4i? I had installed CyanogenMod but i want to revert back to miui. Pls help. Its easy. Follow these steps one by one. 3. Locate Your Stock Recovery Downloaded From Above. 6. Now Download Latest Version Of MIUI From Above. 8. Now Reboot To Stock Recovery. 10. Now Using Volume Keys Navigate To wipe and select both option one by one . 11. Now Using Volume Keys Navigate To Install Update. 12. Let It Install The Downloaded MIUI.